Two current members and one former member of the US Army have been indicted for stealing military weapons and gear from Fort Carson in Colorado and selling it on eBay. Daniel Francis, Todd Charles Crow, Sgt. Johnny Dominic Herrera and Staff Sgt. Benjamin Cardwell were indicted on the charge of conspiracy to commit theft of government property. Herrera and Cardwell currently serve at Fort Carson where they allegedly stole hundreds of thousands of dollars worth of weapons and other equipment. In January, thieves stole the equipment from the base by cutting through a fence and breaking locks to a building housing it. The thieves got away with laser range finders, two mini thermal monoculars and 19 Peltor electronic headsets with accessories. During the same time, 30 sets of tan "Point Blank Vision" body armor and 51 black "Ontario Knife Company" axes in multi-cam sheaths were also surreptitiously taken. Two iRobot SUGV XM1216s worth $187,000 each were also stolen, according to federal court records. One of those were spotted on eBay for a mere $6,000 listed by "amountainman" near Colorado Springs who, court records show was Francis. Francis also allegedly also sold grenade rocket launchers, body armor, weapon accessories, thermal optic devices and military radios on the auction site. 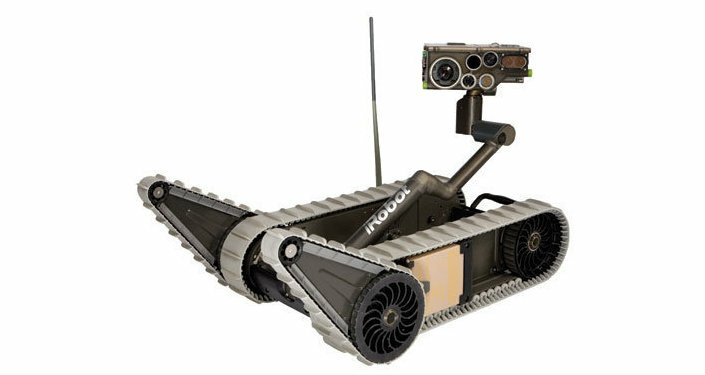 The XM1216 is a lightweight, man portable Small Unmanned Ground Vehicle (SUGV) manufactured by iRobot. The FBI tracked down a man in Alabama who paid Francis between $20,000 and $30,000 for infrared laser devices, Kevlar helmets and other equipment. FBI agents found that Francis had made 40 calls with Crow between Jan. 23 and Jan. 26, during which time the two laser finders had been stolen. Crow served 14 years in the Army including at Fort Carson but was terminated in April 2014. The FBI then traced calls between Crow and Herrera, an Army unit supply specialist stationed at Fort Carson whose job is to inventory military weapons, supplies and equipment. They also found regular phone calls between Francis and Cardwell, who was responsible for the care and maintenance of Army property on the base. According to court records, the investigation determined that Francis made five payments to Cardwell for $1,310, six payments to Crow Family Trucking for $3,200 and four payments to Herrera for $810 by PayPal in the weeks following the thefts and some of the sales on eBay. In a sting operation in April, undercover federal agents met Francis at a grocery store parking lot where he was expecting to sell them uniforms, thermal night vision equipment, an M4 rifle and.223-caliber ammunition.